A Collection of Shiny Objects is a performance collective founded and led by Elizabeth English, Jesse Geiger and Nathan Leigh, with a rotating group of collaborators and associate artists. We create live performance to explore the complexity of contemporary society and popular culture, especially representations of gender, sexuality, class and race. We are committed to blending performance disciplines: incorporating theater, music, dance, puppets, multimedia, and the deconstruction of the artifacts of popular culture. Our process is highly collaborative, involving many participating artists and multiple readings, workshops and developmental in-progress presentations. Our goals for open, in-progress showings are to allow audiences to view and to respond to the work and continue an artistic dialogue about its content and social meaning. A Collection of Shiny Objects is headed to the 2015 NY International Fringe Festival with a New Musical! 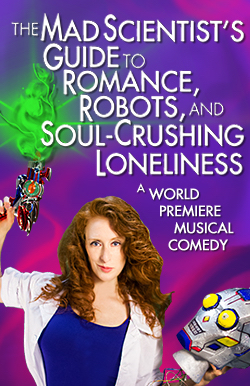 Faced with romantic disaster, a Mad Scientist creates the perfect robot boyfriend. But when her artificial lover dumps her for the girl-next-door, an existential storm ensues, complete with amorous lesbian zombies, robot identity-crises and a quest to save humanity.